Going through a separation or divorce can be a challenging and overwhelming endeavour for so many reasons unique to your situation. It can also be a daunting undertaking during one of the most trying times of your life. For those reasons, it is important to consider a lawyer with expertise in family law. We are here to guide you through this process in a timely, empathetic, and cost effective manner that will assist you in creating the most fitting resolution for your family. WK Family Lawyers is a top rated Calgary Family Law firm. We specialize exclusively in family law and provide exceptional legal counsel and support to our clients during a difficult transition period. With over 30 years experience in the field, we can help resolve issues you will undoubtedly encounter during divorce or separation. You may also want to familiarize yourself with divorce and separation terminology that might help as you begin this process. Making decisions about parenting after a separation is typically one of our clients’ biggest concerns. There are many decisions to be made, but most importantly parents need to consider how they will make decisions affecting their children, and how the division of parenting time will be between parents and children. If parents are able to agree on a parenting plan, the courts will generally not interfere. It is important, however, to ensure that a parenting plan is carefully considered and comprehensive. Plans that are not well designed may lead to unanticipated conflict and instability in the future which will negatively affect children. When separating parents cannot agree to a parenting plan, they can use mediation, arbitration, parenting coordination and the courts to assist. Who will make significant decisions for the children? When married parents are going through divorce or separation, Joint Custody means that both parents make these decisions, whereas Sole Custody means that one parent will make these decisions. How will time be scheduled/shared with the children and the parents? Primary or residential care means that one parent has the majority of the time with the children (60% or more). Shared Custody/Shared Parenting means that the parents equally share time with the children (between 40% to 60%). How will holidays and the summer be shared? How will the parents choose and schedule extracurricular activities, school events and medical/dental appointments? How will consent/notice of travel with the children be decided? How will medical emergencies be handled? What will occur when one parent needs care of the children during their parenting time? In Alberta, the Parenting After Separation course is mandated by the courts before a divorce will be granted. It is a free seminar that can be taken online or in person. This course offers information to parents about the separation and divorce process, the effects of separation and divorce on children, techniques for communication, and legal information that affects parents and children. The course teaches parents the importance of working together to meet children’s health, social, educational, and emotional needs. The program encourages parents to attend mediation and to consider other dispute resolution options. Child Support is a monthly payment from one parent to the other to assist in the financial obligations of raising a child. It may be paid by the child’s biological parents, or in some circumstances, by a step-parent. Depending on whether the parents are married or unmarried, the child support payable may be determined under either federal legislation (for married couples) or by provincial legislation (for unmarried couples). With some exceptions, the legislative principles are the same. The amounts payable for child support are governed by Child Support Guidelines. There are essentially two components to child support. First, there is a “base” support payment made by one parent to the other. This payment is determined with reference to legislated tables (the “Guidelines”) depending on the payor’s province of residence, the number of children for whom support is to be paid, and the payor’s income. Support is generally paid by the non-custodial parent to the custodial parent. In situations where the children’s residence is shared, both parents may have this obligation resulting, generally, in a net amount of child support paid from one parent (usually the higher income earner) to the other. Generally, the parents are to share these expenses in proportion to their respective incomes. Child support is paid for children under the age of majority (18 years of age in Alberta). Child support may be paid for children over the age of majority if the child is still dependent on the parents (for example, if the child is pursuing post-secondary education). Many factors must be taken into consideration when calculating both spousal and child support such as eligible tax credits, deductions and parenting arrangements to name just a few. Because every family’s circumstances are unique and these calculations can be very complex, we recommend that you seek advice specific to your situation from both a family lawyer and an accounting specialist. This child support table look-up will help you find the base amount of child support. Read the Step-by-Step Guide and the Table Look-up Disclaimer for more details. The Guide offers instructions and worksheets that will help explain how to calculate child support amounts. You may wish to ask a lawyer for advice about your situation. The base amount is often not the final child support amount to be paid. For example, if there are special expenses such as child care or if you share custody, the amount will likely be different. The Child Support Table Look-up has general information only. It is not a legal document. The tables were last updated December 31, 2011. To determine how much child support is owed from May 1, 2006 to December 31, 2011, use the 2006 tables. Note that provincial or territorial guidelines may apply in some cases. Note: Several companies sell software for calculating child support. Be aware that the Department of Justice was not involved in the development of that software. If you were in an unmarried cohabitation, your separation is not governed by the same legal framework as that of married couples. The Divorce Act (federal legislation) and the Matrimonial Property Act (provincial law) do not apply to these relationships. This means there is no presumption of equal sharing in property in common law relationships in Alberta. In Alberta, property division in these cases is governed by the principles of Constructive Trust and Unjust Enrichment. In plain language, this means that the person claiming an interest in property must show that the other party has been enriched as a result of the contribution (financial or non-financial) of the claimant and that there has been a corresponding loss to the claimant. These claims generally require a thorough analysis of all the applicable factors and we highly recommend that you consult legal counsel if you believe that this situation applies to you. The process from separation to the actual divorce being finalized can take many different forms, from negotiated settlements on your outstanding issues, to mediation, arbitration, or court ordered solutions, or a combination of these ways. You do not necessarily need to appear before the court to get divorced, but the court does eventually have to grant your divorce judgment. It is fairly impossible to predict how much your divorce will costs, as the costs depend on a number of factors as you go through the process. When you retain legal counsel you will have to pay a retainer fee, which may vary from lawyer to lawyer and sometimes depends on the nature of the immediate steps to be taken in a particular case. Generally, the more amicable the parties are in resolving their outstanding issues, the more cost effective the process will be. Our experienced family lawyers are happy to help explain the pros and cons of each process option, and what may be the preferred approach in your situation. Learn more about these options below. Mediation is a negotiation facilitated by a neutral third party—a mediator. At WK Family Lawyers we have a number of trained and experienced mediators. In addition, all of our lawyers regularly attend lawyer-assisted mediation with clients in an effort to achieve a mutually agreeable resolution to their matrimonial issues stemming from the separation. Mediation is a voluntary process. Any outcomes or agreements reached are non-binding until they are cemented into a court order or contract, which has been signed by both parties upon having obtained independent legal advice. Many clients choose to participate in mediation as their preferred process because it is generally more cost-effective and faster than going through the court system—especially litigation. It is also often the preferred mechanism as it helps parties craft their own solutions for their unique family situation instead of relying on a third party to make the decisions for them. 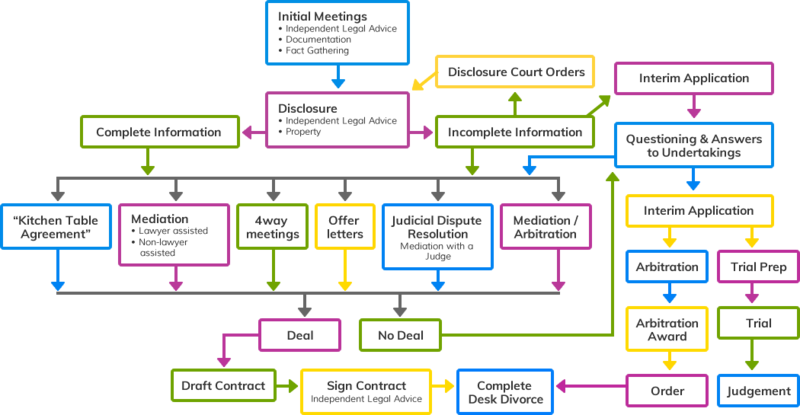 Arbitration is another common binding alternative dispute resolution process. In arbitration, the parties give an independent neutral third party the authority to make a decision on one or more issues concerning their divorce or separation. The Arbitrator is often a lawyer trained in arbitration and in Alberta the process is governed by the Arbitration Act, R.S.A. 2000. Before submitting a matter to arbitration, the parties execute an Arbitration Agreement, which outlines the jurisdiction of the Arbitrator as well as procedural steps to be taken. An Arbitration hearing can be conducted in various ways. Some clients decide on a very informal process while others opt for a formal process resembling a trial. Clients typically discuss and decide on the different options most suitable for their case with legal counsel. The decision rendered by an Arbitrator is called an “Arbitration Award”. The Award is a binding decision and parties and counsel typically incorporate the document into a court order. The grounds for appeal of an Arbitration Award are extremely narrow. Four way meetings, also referred to as settlement meetings, are meetings with the parties and their respective legal counsel in attendance. These meetings can be an effective tool for reaching resolution to the issues at hand without necessarily incurring the costs associated with the court process. They typically take place in the offices of one of the party’s legal counsel. Judicial Dispute Resolution (“JDR”) is essentially a mediation facilitated by a Judge/Justice of either the Provincial Court or the Court of Queen’s Bench, depending on where your court action was commenced. Litigation is the process of resolving disputes with the assistance of a Judge who makes a decision on the issues put before them in a court application. In family law, matters put before a Judge can be of an interim nature or can result in a final order following a trial. Litigation can sometimes be a drawn out process that is taxing on the parties financially and on many other levels. At WK Family Lawyers, we have experience litigating matters at all levels of court in Alberta (Provincial Court, Court of Queen’s Bench, and the Court of Appeal). Although going to court may not be the preferred process of option of many parties, in certain circumstances it may be necessary in order to achieve a resolution. When it comes to finances, there are no secrets in family law. When going through a separation or divorce, the parties must be prepared to disclose all their financial information to each other. In complex financial situations more detail will be required. In Alberta, the division of property after separation of a married couple is governed by the Matrimonial Property Act of Alberta. The Matrimonial Property Act is provincial legislation and particular to Alberta. Division or distribution of marital property in Alberta may differ from that in other Canadian Provinces. any other property (sometimes generically referred to as ‘matrimonial property’. Categorizing the property accurately is critical as that will determine how it is shared between spouses. the proceeds of an insurance policy that is not insurance in respect of property, unless the proceeds are compensation for a loss to both spouses. In order for an exemption to be claimed at the end of the marriage, the asset must exist. If the asset is consumed, the exemption is lost. The party claiming an exemption in a certain asset must be able to trace the exemption in order to successfully claim the exemption. When a party puts an exempt asset into joint names, part of the exempt value is lost. In this situation the Court would assume that there is a gift of one-half of the amount of the exemption to both parties. If an exempt asset increases in value over the course of the marriage, that growth generally is divided between the parties to some extent, although it might not be an equal division. A court would normally analyze what is “just and equitable” under the circumstances. There are a number of legislated factors that a court may consider in terms of how this property should be shared between spouses. Gifts between spouses are likewise shared in this fashion. Any property that does not fall within the categories of ‘exempt property’, ‘growth on exempt property’ or a gift between spouses falls into a third, or ‘catch-all’ category – often referred to as ‘matrimonial property’. Matrimonial Property is generally acquired during the course of a marriage by either spouse. It does not matter in whose name the property is held or registered. The presumptive approach to matrimonial property is that it is distributed or divided equally between the parties. Parties can contract out of the provisions of the Matrimonial Property Act, but only if specific, legislated requirements are met. The general approach in Alberta is that assets are valued at the date of Trial, not the time of separation. This is not always the case, however, and warrants a case by case analysis and warrants that the values of assets and debts may need to be updated periodically. A person may be entitled to spousal support when divorcing or separating (common law arrangements). Many factors are considered in determining spousal support entitlement. The question of whether someone is entitled to receive spousal support is complex and subject to some discretion. Spousal support ranges will vary depending on the income of each party, how long the relationship lasted and whether or not there are dependent children. Spousal support calculations can be complex. We recommend consulting with your family lawyer to discuss entitlement as well as quantum (amount) and duration of spousal support with you in greater detail. Feeling overwhelmed and need to talk to someone? Confused? We can help guide you through the process.